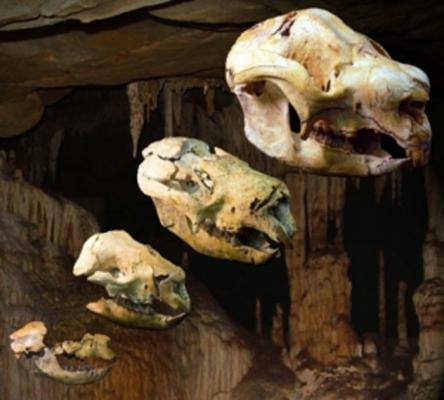 “A giant fossil Koala Skull of Nimbodon. . . . Australia’s history is . . . fascinating as it was the last stronghold of the world’s megafaunal animals. over 20 times the size of its modern day counterpart.Not much was known about Nimbodon, however, until recently, as the fossil find consisted of a few fragmentary craniums from a cave in Riversleigh, Queensland. Now researchers, led by Karen Black from the University of New South Wales, have unearthed more complete skulls which reveal a lot about its lifestyle. Nimbodon lived 15 million years ago in the tree tops, allowing it to feed and escape marsupial lions such as Thylacoleo, which possessed the most powerful bite of any land-dwelling mammal.’Nimbadonwas a highly capable, habitual climber and its specialized anatomy suggests it may have adopted a trunk-hugging method of climbing similar to the living koala,’ Black said. This find is not only a ‘significant resource’ due to its rarity and preservation, but it provides evidence from individuals across the age range. The teeth allow for an accurate reconstruction of diet and growth rates; and the craniums the ability to study the brain, locomotion and behaviour.Fossil teeth are incredibly important. The way they grow provides a rich seam of palaeontological information. It is fortunate that they are also the hardest part of the body. As a result they are invaluable when studying mysterious and elusive creatures like Nimbodon. We have a good picture of the story of life, yet Nimbodon is another piece of its puzzle which we have put in place. Every animal was greater in the past, Austrailia is no different. Every animal is represented in the fossil record as having a giant antecedent. Each fossil demonstrates that the greater ancestor of each animal is bigger, better, faster, and stronger than its weaker descendants.